Travel Guide: Exploring of Palaces Past in Sintra, Portugal — Blake Erik. 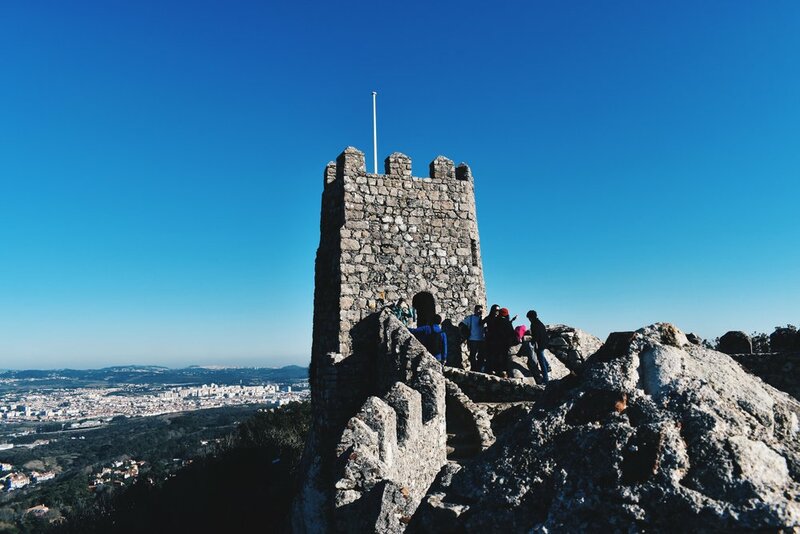 Located on the Estoril Coast, Sintra is a place of stunning palaces, historic monuments, and important fortifications that have served the town and it’s surroundings for years. 40 minutes away from Portugal’s capital city, Sintra is a town located in the lush greenery of Parque Natural de Sintra-Cascais. Here is where Portuguese royals used to spend their summers, and this can be seen in the town even today. Though popular for day trippers, it’s easy to stay for a couple days too . My recommendation is to not do more than 3 sites in a day, reason being that these palaces and monuments are vast and sprawling enough to get lost in for a good few hours, to really appreciate and understand it’s history and beauty. From my trip to Portugal, I've turned some of my photography into my brand of everyday products which you can check out below. Worldwide shipping is available so if you're looking for a notebook with dot grid, blank or ruled pages (with a cover from Sintra itself! ), tote bags, postcards & tumblers to take home to remember your travels if you too have been to these parts of Portugal, or for some travel inspiration! Luckily for the traveller, the local Scotturb buses have become sort of tourist buses to ease the traveller into settling their transport for the day. Getting out of the train station, a queue has probably already formed to wait in line for the buses. You get the option of getting the hop-on-hop-off tickets for a circuit (€5.50) of two routes, the first connecting the National Palace (Palacio Nacional) / old town centre, the Moors Castle (Castelo dos Mouros), and Pena Palace (Palacio da Pena); while the second linking the National Palace (Palacio Nacional) / old town centre with Regaleira Palace (Quinta da Regaleira), Seteais Palace (Palácio de Seteais), and Montserrat Palace (Palácio de Monserrate). You can get an unlimited hop-on-hop-off day pass for €12, but I don’t think this is quite worth it in any shape or form unless speeding through sites without actually seeing them is your gig. Starting with the National Palace, we opted for the family ticket for all 3 sites we were headed to (if you’re travelling in a family this is honestly the best option— we used it everywhere) and started our tour. The key feature of this palace where nobility occupied from the 17th to 19th centuries is the chimneys reaching high up into the sky, which begin on the inside of the palace in the kitchen, which was easily the most impressive even from the inside. We passed through halls, rooms and exhibits before finally entering the gardens outside, which had a pretty terrace view overlooking the old town centre. After which, we headed to Tacho Real, a restaurant located off the main streets (where the good ones are), heading uphill. Entering the tavern, the restaurant is decorated with an odd white and green colour scheme (odd, because we’re a world away from Ireland), but the food was fantastic and service was excellent. There’s a running joke that the owner of the restaurant, a local Portuguese, looks like Robert De Niro and I even got a picture with good ol’ “Rob”. It’s also here where we tried local Portuguese desserts like Toucinho de Céu and which was fantastic, but like all Portuguese desserts, are very sweet but incredibly flavourful. With our tummies filled, we got on the bus to the Moorish Castle. Built by the Moors, the Castle was a fortified wall to protect the town perched in the high hills. Note that the castle demands quite a lot from the visitor when it comes to walking the walls, with multiple flights of stairs and ramps that incline and decline. Exploring it properly, you’ll climb the battlements to get to some truly jaw dropping views over the hills of the Lisbon estuary. Just before last light, we headed to the Pena Palace, easily the sight that fronts most postcards from Sintra. Built in the style of romanticism, this castle looks more like a Disneyland castle straight out of a fairytale, with the walls painted and tiled in the most vivid of colours and mythical creatures like gargoyles line the walls. The interior and restored rooms used by the Royals are equally interesting and there was plenty to see, from reception rooms to bedrooms to dining halls. From Queen Amelia’s balcony, as well as the terrace of the palace’s cafe, the sun began to set, painting the walls a bright orange. It was incredible to see just about everyone stopping in their tracks, getting their phones or coffees out and taking in the sunset. It’s honestly incredible to me when complete strangers come together to appreciate an everyday phenomenon like a sunset filled with the wonder and magic as if seeing one for the first time. With that, that was pretty much the end of our day in Sintra before we headed back into the city for dinner. Sintra overall felt quite a bit like Disneyland for adults (or kids I suppose too), with stunning sights a world away from Lisbon. With another visit, I would easily take the other route and hit the other three sites, but at this pace we really got to explore every attraction we got to and was a fascinating day trip out, bit touristy but interesting for the first time. This is the most popular route for travellers to take because it’s closer to Lisbon’s city centre, making it closer to get to if you’re already in the city. The trains, operated by Comboios de Portugal, takes about 40 minutes to Sintra. For travellers moving on from Lisbon, Oriente Station connects Lisbon with other cities and towns by rail. It’s also more convenient coming from the airport to go to Oriente. The journey takes just under 50 minutes. NOTE: You can use the Viva Viagem rechargeable ticket which would reduce the cost of your trip from €2.15 one way to €1.80 and there is no return ticket option. Seats also cannot be reserved.